We've sold out! Or rather, Quimby's Bookstore in Chicago has sold out of their copies of Two Fisted Librarians #1! However, they've asked for some more (double their initial order! ), and they'll soon be arriving on store shelves. In other news we've been so incredibly overwhelmed with school that even if we got everyone's submissions by Halloween, there is no possible way we'd be able to put the zine together any time soon. So the deadline for submissions has now been extended to DECEMBER 31ST! Yes! You get two additional months to get your contributions in, and we'll hopefully have a launch party at some point in January. 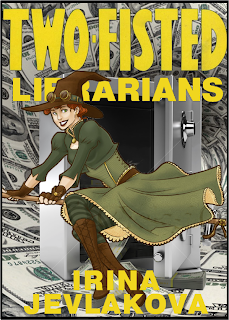 Send your submissions, questions, and awesome links to twofistedlibrarians@gmail.com. Of course, nobody actually submitted a bio, so we used theyfightcrime.org, which apparently has gone down since the zine was originally made. Here's an archive.org mirror, it won't generate anything new, but you'll see what it was like. Anyway, here's the third (and final for now)! Irina Jevlakova wrote Victoria Dexter and the Mechanical Library. What will we do for future contributors? Who knows! But you should make sure to submit something before the October 31st deadline if you want to find out!